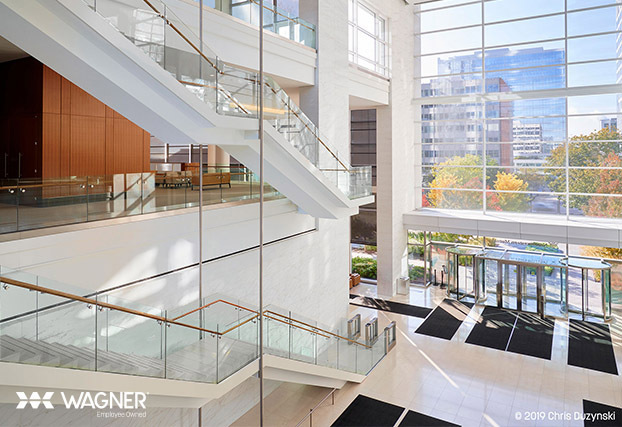 Wagner Architectural Systems is a leading global supplier of architectural railing systems, custom fabricated metalwork dedicated to producing life-safety and lighting products that meet the highest standards of quality, engineering & code compliance. We work with architects, lighting designers, engineers, contractors and even DIY small-businesses or professionals to deliver complete product systems. We custom engineer and fabricate design-specific stair handrail, metal railing, stainless steel cable railing, pipe handrail, and glass railing panel solutions as well as architectural lighting that provide safety, assist navigation, and elevate the architectural aesthetic of common space designs. 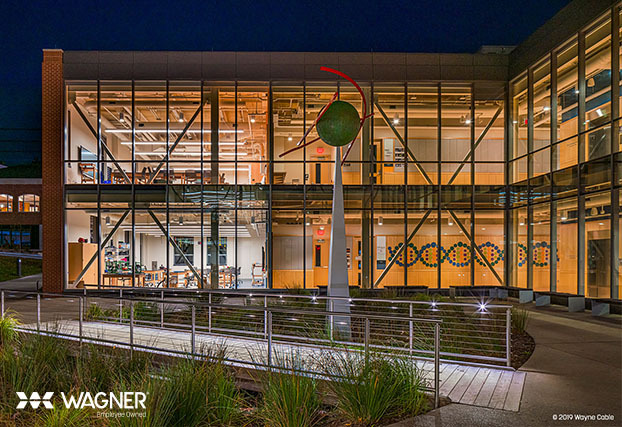 Our expertise in metal manufacturing, code requirements and LEED building standards means you get a partner who can meet your specifications and deliver installations with the fit, finish, beauty & performance you desire. 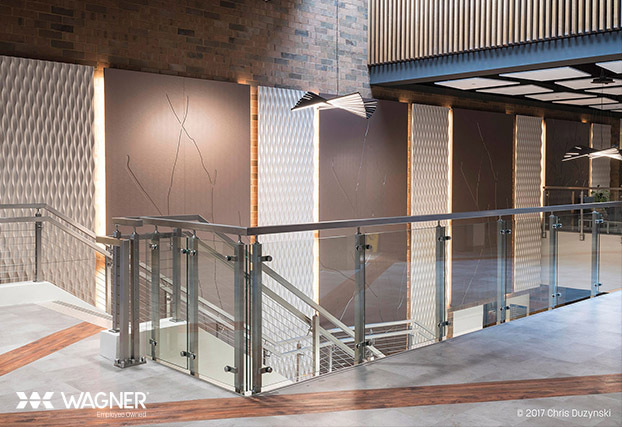 Legato™ Railing Collection - Our post mount design solution offering affordable glass rail with an extraordinarily easy glass railing installation and an endless array of customizable options. 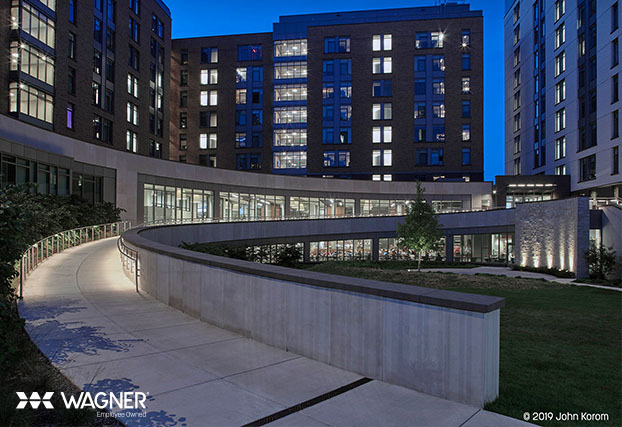 Lumenrail® Architectural Systems - Our illuminated handrail / rail system uses a state-of-the-art, low-voltage LED illumination to enhance any stairway, walkway or ramp. Available in both point-source and linear options, making it a perfect solution for any handrail configuration. Panel Grip™ Dry Glaze System - Provides the railing installer with a cleaner, simpler method of setting tempered glass panels into our structural shoe molding - visibly sleek due to the streamlined no-post design. 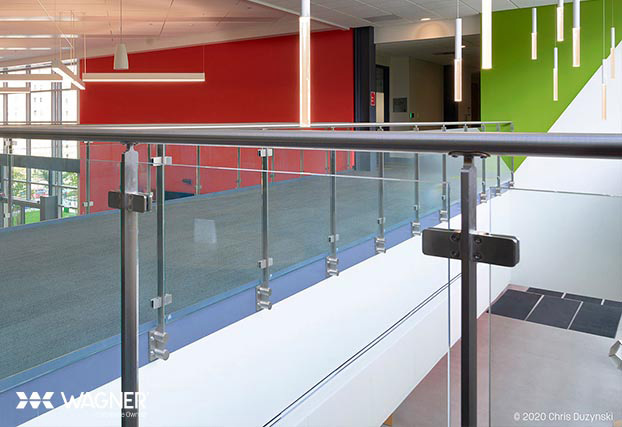 Cable Railing Systems and Components - Allows for configurations with great sight lines and a sleek stainless-steel design. 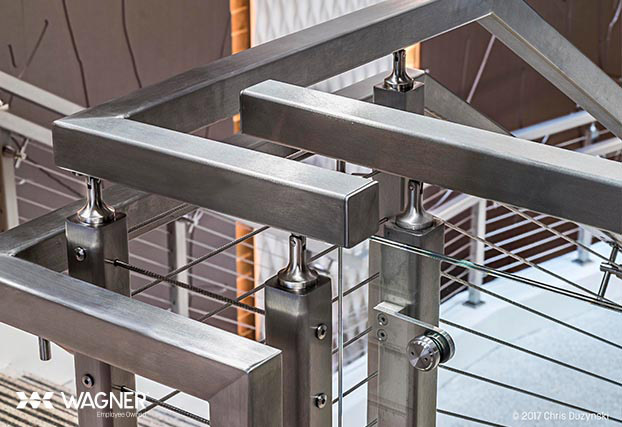 These stainless-steel cable railings provide aesthetics and flexibility in any setting. Archimesh Infill Solutions - Framed, woven type 304 stainless-steelmetal wire panels for use in our architectural metal railing systems. Lumenpod® 16 - The next generation, integrated, point source, handrail luminaire. 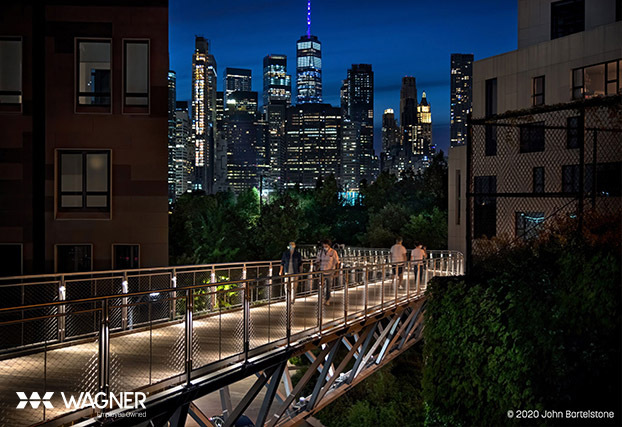 The mechanically threaded Lumenpod® is designed for pathway illumination with mounting options for hand rail, safety railing, guardrail, decks, balconies,porch applications and shelter or entry structures. Performance lighting, superior harsh environment protection and vandal resistance are combined with a simple installation. The luminaire provides a low-profile architectural solution for new or retrofit applications. Bantam™ is a new generation of small form factor, LED, post or flat surface mount luminaire. This post mount fixture is designed for wall grazing and pathway illumination with mounting options for railings, walls, decks, porches, balconies and entry structures. 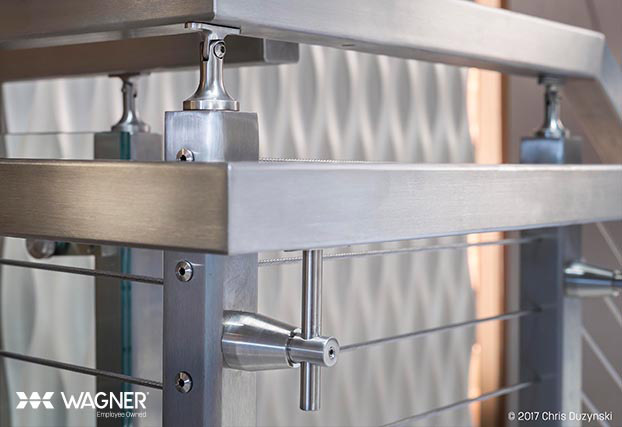 With a simple field or factory prepared installation using included 316 stainless steel hardware. The Bantam provides an inconspicuous architectural illumination solution for life-safety installations. PanelGrip® - Building upon the legacy, Wagner introduces the new streamlined design of PanelGrip. 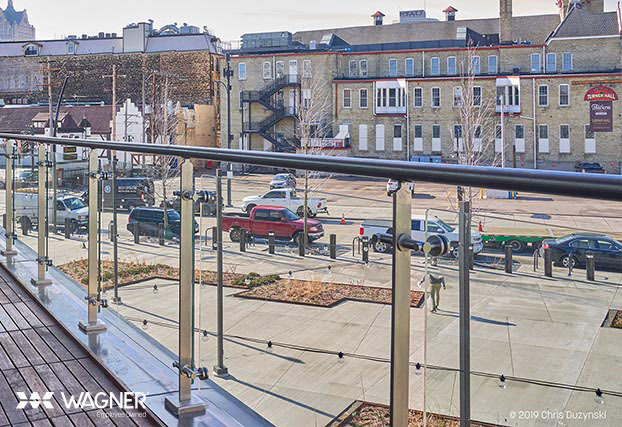 With its unique, durable locking mechanism and specially designed, lighter weight aluminum base shoe-moulding, installation of this glass railing system is faster and more cost-effective than other standard dry glaze options. 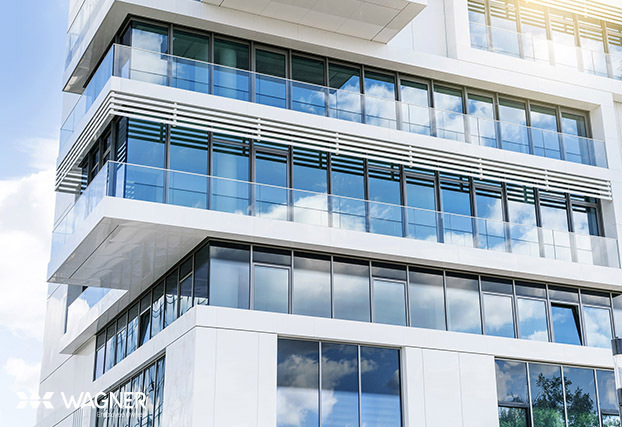 Lumenpod® 28 - The evolution of the hand rail point source from Wagner Architectural Systems has performance that far exceeds the first or second generation products on the market. 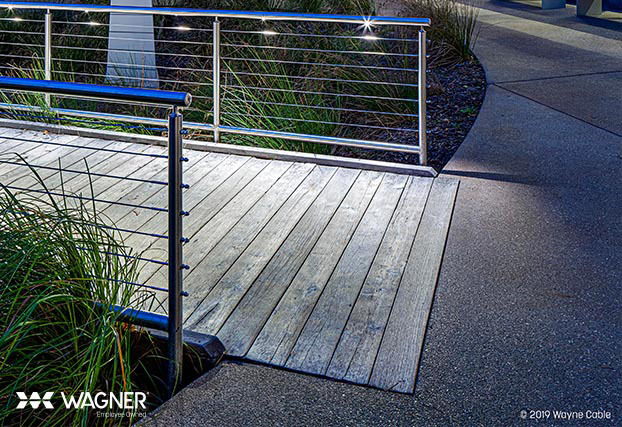 This USA engineered and manufactured luminaire is designed for pathway illumination with mounting options for hand rail, guardrail, decks and shelter or entry structures. Both the asymmetric and symmetric versions have outstanding performance developed specifically for the application. The superior harsh environment protection and vandal resistance are combined with a simple installation. The Lumenpod 28 provides a flush profile, architectural solution for new or retrofit applications and egress compliance opportunities. Wlidlife Amber Options - The environmentally friendly Wildlife Amber output option is available for projects near protected coastal wildlife areas. Wagner received an official certification from the Fish and Wildlife Conservation Commission which monitors activities involving marine turtles in Florida under authority granted to the state through a Cooperative Agreement with the U.S. Fish and Wildlife Service. Available in our linear and point sources product with certification. 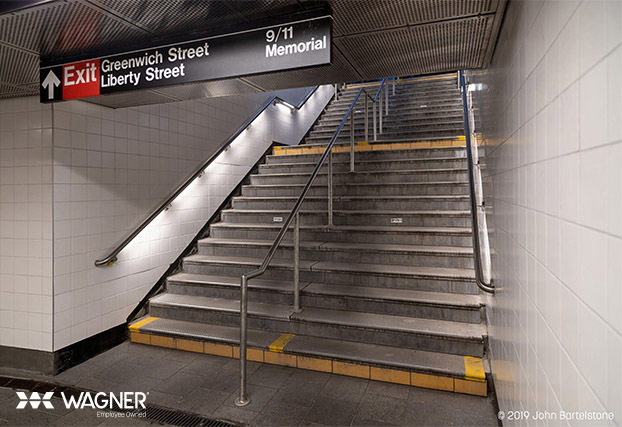 As a handrail, railing, metal component manufacturer and supplier, The Wagner Companies is in a unique situation – nearly all our products are made from some percentage of pre- and post-consumer recycled material. An inherent property of all metal products is that they can be recycled after their intended use is no longer required.